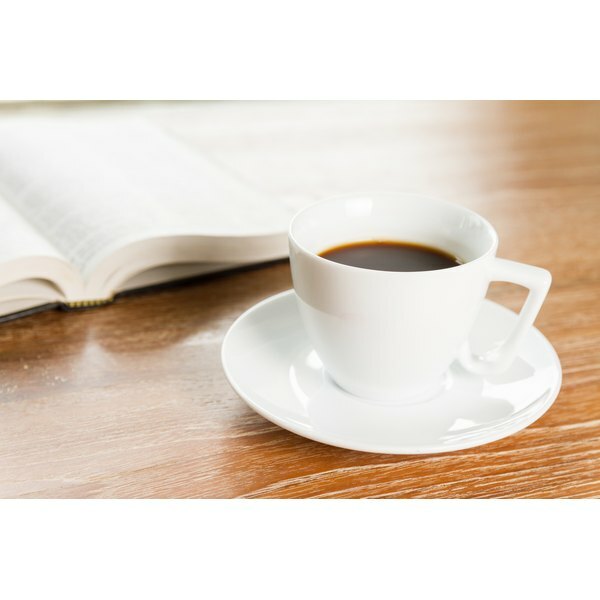 Caffeine is a commonly consumed substance and part of many people’s diets. Atenolol is in a class of drugs called beta blockers, often prescribed for a variety of cardiac conditions. Caffeine can have a direct effect on this medicine. Additionally, it can contribute to other health problems for beta blocker users, including heartburn and overheating. Caffeine is a bitter-tasting substance found in all non-decaffeinated coffees, many kinds of teas, sports drinks, colas and other soft drinks. Even a cup of hot cocoa or a chocolate bar contains a small amount of caffeine. Enjoyed in moderation, caffeine serves as a mild stimulant that can increase your energy and help keep you alert. Too much caffeine, however, can cause symptoms such as an irregular heart beat, nervousness and insomnia. Atenolol, also sold under the brand name Tenormin, is a beta blocker, a class of drugs often used to treat angina, congestive heart failure or high blood pressure. It is also sometimes used to treat arrhythmia. Such drugs work by countering the effects of adrenaline on your heart, meaning that the heart muscle doesn’t have to work so hard. Beta blocker medicines such as atenolol can also block impulses that cause an abnormal heart rhythm. Your should take this drug at the same time every day, and with a full glass of water. Caffeine can decrease the effects of beta blockers like atenolol, according to the Texas Heart Institute website. For this reason, those who take atenolol should avoid coffee and other caffeine-containing foods and drinks. Another reason to think twice before drinking or eating caffeine-containing substances with atenolol is that beta blocker drugs are among those that can weaken the lower esophageal sphincter, contributing to heartburn and GERD, or gastroesophageal reflux disease. Since coffee and other caffeinated drinks can irritate the lining of the stomach, ingesting them can worsen GERD's uncomfortable symptoms, such as a burning sensation in the chest, belching and nausea or vomiting. Another concern when taking atenolol is its potential for disrupting the body’s natural ability to adjust to temperature changes. In hot temperatures, your body responds by increasing blood flow to the skin so that heat can be released through sweating. Because a beta blocker drug can reduce your heart’s ability to pump more blood to the skin, in hot temperatures you may be at greater risk for overheating or becoming lightheaded or faint. Coffee, colas and other caffeine-containing beverages are best avoided by atenolol users, especially during hot weather, since they can potentially contribute to dehydration.